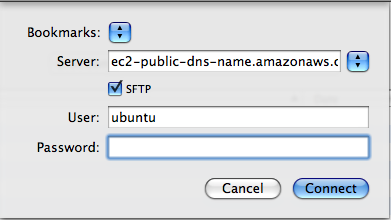 Ken: Life gets a lot easier if you upload your personal ssh key to EC2 and use that when starting instances. Then you don't need to keep specifying the identity in ssh, rsync, and other commands. Ah, yes, Eric. I've been meaning to try that. Thanks for the great tip. Nice information and thank you for sharing. doesn't work for me. what is the connection between TextWrangler and the config file I created? Have I missed something? khany, the config file's purpose is to allow you to use SFTP without needing to specify the identity file every time. Text Wrangler doesn't even give you the option of specifying an identity file, which is why this is important. That said, your best option is to upload your personal ssh key to EC2 as Eric Hammond pointed out in an earlier comment. If you could explain step by step what ken is tallking about, that would be helpful. Thanks a ton for this advice!! I very appreciate your post to make the connection to EC2 throught TextWrangler. I tried them along what you mentioned. Except connecting with Text Wrangler, I succeed in using ssh in terminal. Any idea to fix this error?? You cana add ec2-user in webapp group then... and edit on it. FYI: I believe all of this stuff with the ssh config file is unnecessary if your standard ssh public key, the one in ~/.ssh/id_rsa.pub, is installed into the account on EC2 you're trying to connect to (in the .ssh/authorized_keys file). That's what I do...I add my standard public key to the EC2 account rather than having to do fancy configuration on the client side. We do this, in fact, as a matter of course to control who in our company has access to particular machines. This has worked for me until about the time I upgraded to Yosemite. Now, I can connect with BBEdit via SFTP to some machines but not others, and I can't figure out why. I'm getting the same 22807 error. I've checked the configuration of sshd on each machine, and they're the same for machines that work and ones that don't. I can, in all cases, do a "ssh @" using the same values I put in the BBEdit connection dialog. To my understanding, if this works, so should the BBEdit connection.